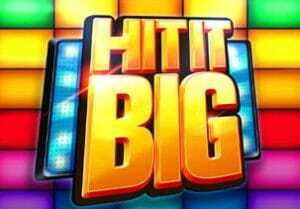 Hit It Big is a 5 reel, 5 payline slot game from ELK Studios. On any spin you could trigger a modifier that awards a multiplier of between 2x and 50x, a respin or stacked or sticky wilds. There’s also a multi-level pick me round. Play this high variance game on your computer, laptop, tablet or mobile from between 20p and £100 per spin. The colourful Hit It Big has the feel of a TV gameshow. The reels are made up of single, double and treble bars and green, blue and red 7s. The golden 7s symbol is the most lucrative. Land 3, 4 or 5 of these in combination for a payout of 7, 25 or 50 times your stake. The golden crown is the wild. This can land anywhere and substitute for all of the standard symbols. The main attraction is the Hit It Big Bonus Game feature which is a 3 level pick me round. It’s triggered by landing 3 Bonus symbols on the same spin. The action here takes place on a 5x5 grid made up of an outer circle, an inner circle and the Big Hit centre screen. A cursor bobs around the position on the outer circle to begin with. Click on the stop button. If the cursor lands on a multiplier, that amount is applied to your stake. That position then turns into a Bandit. If the cursor lands on an arrow pointing inwards, you’ll progress to the inner circle. An outward pointing arrow takes you back a level. Keep on stopping the cursor until you land on a Bandit which ends the feature. The goal is to reach the Big Hit centre screen where the biggest prizes are on offer. Each click of the cursor could deliver an award of 1,000 times your stake. In total, there’s 2,500 times your stake to be won in total here. There aren’t any free spins on offer here which might be a deal breaker for some players. You can expect to land the modifiers regularly so there’s no shortage of action. We found them really hit and miss on the payout front though. Even triggering multiple modifiers on the same spin doesn’t guarantee a payday, let alone a big one. It’s a similar story with the Big Hit Bonus Game feature which we found to be a real feast or famine affair. This is a volatile game though. If you like volatile slot games, then you should find plenty to enjoy here. Get lucky with those pick me prizes and Hit It Big could live up to its name. If you like gameshows, Who Wants to be a Millionaire (MegaWays) from Big Time Gaming is recommended and has the potential for huge wins.